Anyone who has spent a second of their time on Pinterest knows that it is flooded with elegant DIY ideas to fill up your house. It’s not an easy feat to get a kid to pay any mind to home décor. What are decorative pillows if not for fighting? What’s the point of a bowl of fake fruit you can’t eat? What’s a vase if you can’t throw it? Coasters? Well those just don’t make the least bit of sense to a young mind. But what happens when you give a child a mess of recycled comic books, a cup full of sticky glue, a 4×4 tile, and total creative freedom? The coolest addition to your coffee table ever, that’s what. These comic book coasters, inspired by an image found on Pinterest, are not only super stylish, but also a lot of fun to make. 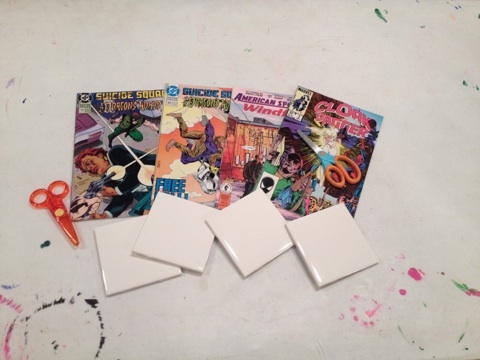 Using 4×4 plain white tiles that can be purchased at Home Depot for $1.14 a piece, your standard Modge Podge and comic books sold for fifty cents a piece at Bookmans, young Bookmans Grant visitors created something unique and useful. Once the children had found images from the comics that tickled their fancy, they stuck them onto their tile with a layer of Modge Podge. 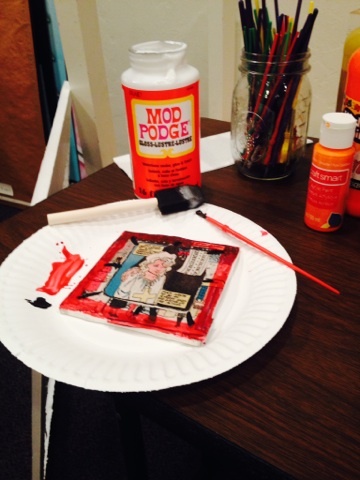 Once their top coat of Modge Podge was dry, some of them decided to add more color. 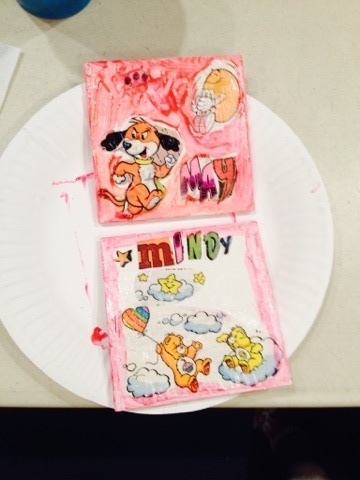 The kids expressed their colorful creativity with borders, images and letters. From Beetlejuice to Superman, everyone found a way to express themselves. Each coaster was completely unique and something to be proud of. While simply decorating the tiles is a really fun way to get artsy, the coasters are not practical for use without putting felt on the bottom. Parents are encouraged to assist their child with a hot glue gun or Tacky Glue as they stick felt rounds on each corner of the bottom of the tile to prevent surface scratching. Bookmans Speedway turned recycled record sleeves into awesome sketch books using a simple recipe of old record sleeves, paper, ribbon, markers and glitter. The coolest part about these rad sketchbooks is that you can add more paper when you run out! Bookmans Ina recycled CDs into dazzling fishies! Using funky paper, glittering gems, googly eyes, crafting sticks and old discs, they made creations that rival rainbow fish himself! Who would have thought there were so many ways to recycle your old items? 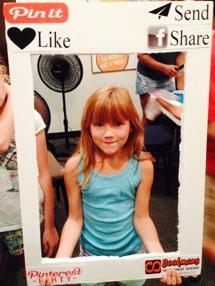 For more summer kids events, check out our events calendar!